Aladdin: Legacy Of The Lost Average 0.00/5 - out of 0 total votes. From the mystical city of Shambhalla to the ends of the Earth comes a tale of magic, mystery and the motivations of power. It is the world of Ala ad-Din, better known as ALADDIN. 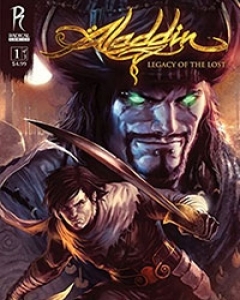 Thief, gambler, liar and cheat, born in a brothel and raised on the streets, Aladdin falls under the eye of the sorcerer Maugrah, who has scoured the sands for the Dreaming Jewel-a lost relic of shattering power, able to steal the magic of the Djinn of the Lamp and reshape the world in his own dangerous design. But to do so, he requires a mystical ability carried within Aladdin's blood...power that not even Aladdin himself knows about. An epic adventure that takes the classic saga to dark, new territories with multi-Eisner nominated writer Ian Edginton!